CHINA is heading into a new Mao-inspired epoch of socialism and nationalism, says the founder of China’s most powerful leftist internet platform. Han Deqiang, who founded and retains behind-the-scenes control over the Utopia website, says most observers have failed to notice a profound shift in China’s ideological and political trajectory. Anniversary at the Great Hall of People: 100 years since the pivotal Xinhai Revolution (辛亥革命) which ended millennia of dynastic rule, third-generation leader 85-year-old Jiang Zemin makes rare public appearance to dispel rumours from Japan and Hong Kong he has passed on. Jiang Zemin, China’s former president attended celebrations commemoration the 100th anniversary of the revolution that overthrew the emperor, his first public appearance since rumours emerged that he had died. 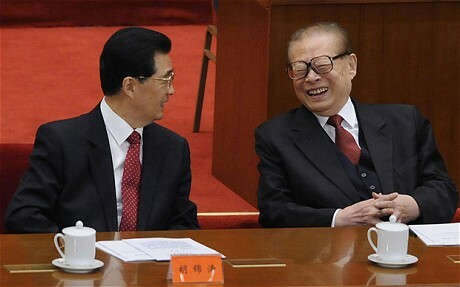 Mr Jiang, 85, was seen sitting with other top Communist Party officials at a ceremony hosted by current President Hu Jintao in Beijing and broadcast live on state television. He looked frail and was once shown nodding off. Rumours of Mr Jiang’s death began circulating in July after he failed to appear at a meeting celebrating the party’s 90th birthday. They gathered momentum and culminated with Hong Kong and Japanese media saying his death had been confirmed.